Borderlinx | Buy Bonprix and ship worldwide with Borderlinx. Cheap rates guaranteed. Bonprix Germany is inexpensive fashion for the whole family, plus household items, novelties and interior decorating products at the right price. This popular retailer is an OTTO Group subsidiary, and boasts nearly 30 million customers through catalog sales, physical stores and the Bonprix Germany online shopping site. Value and affordability are key with Bonprix Germany, from great prices and ongoing sales and discounts to 3-month and 6-month installment payment plans. The variety of available Bonprix Germany products makes this an excellent one-stop shopping destination for all. Browse the full range of apparel, including lingerie, outerwear, shoes and accessories. And Bonprix Germany fashion caters to all sizes, including plus size clothing at no extra cost. Bonprix Germany strives to make your shopping experience fun and easy with features like an online wish list, allowing you to purchase your favorites at your leisure, and a size advisor that helps you ensure a proper fit for clothing, as well as guides and tips for choosing curtains, linens, slipcovers, furniture and more. Enjoy purchasing from Bonprix Germany with delivery to your home country through Borderlinx international shipping! Now delivering to 64 countries, Borderlinx has the solution worldwide shoppers are looking for. 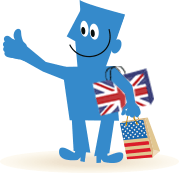 Check out how to get your own UK or US address for shipping from your favorite online shops and learn about other Borderlinx benefits. A number of services are available through Borderlinx to make international ordering from Bonprix Germany hassle-free, including shipment value protection, free repacking and consolidation services.